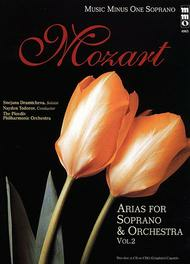 MOZART: Opera Arias for Soprano and Orchestra, Vol. II composed by Wolfgang Amadeus Mozart (1756-1791). For soprano voice. Vocal Score and CD+G. Published by Music Minus One (MO.MMOCDG4065).ISBN 1596155493.European opera star Snejana Dramtcheva brings you closer to mastering the great operatic works of Mozart for soprano and orchestra. Listen to Ms. Dramtcheva demonstrate perfect renditions of these classics, then learn them yourself with your own hip-pocket orchestra!Includes a printed vocal score on high-quality ivory paper, with informative liner notes; and a CD+G graphics-enabled compact disc with complete versions (with soloist) followed by stereo orchestral accompaniments to each piece, minus the soloist. About CD+GCD+G (CD+Graphics) is a special disc format in which simple graphics and text are stored in the sub channels of an audio disc. When you play a CD+G disc in a CD+G compatible player (like a karaoke machine), lyrics and images appear on the monitor or TV screen in time to the music. If you play a CD+G disc in a regular CD player, you'll still be able to hear the music and sing along to your favorite tracks, but the graphics features won't function. The CD+G format is a fun and useful learning tool!